aS Shorts #1: With an Umbrella half opened. Hiatus brews ideas. Here's a new one. Presenting to you, aS shorts - short stories that will melt like butter on warm hearts. Enjoy. "Oh no, not again! What's wrong with Mumbai!!!" I exclaimed as a perfectly fine Mumbai evening turned first into a drizzly walk to the bus stop and then with some 100 more steps left, cruelly went on to pour heavily. Talking angrily to myself I begun to open my blue bordered umbrella. "You can't trust anything here. Struggle for everything. This is just not done!" And BEST bus 172 overtook me, quite literally. With an Umbrella half opened, I realised that this was the bus I was supposed to catch. With an Umbrella half opened, I ran! The bus slowed at the stop and passengers made a beeline in the rain to get in. I was some 20-30 steps behind, all confident to make it in. As the bus slowly accelerated again, I picked up my pace only to slow down again, rather abruptly. Just ahead of me was a guy with a scooty, driving really slowly, practically dampening my every chance to grab the ever accelerating bus's door bar. "Bhak Mada..." I looked at the guy's face midway hurling my two-worded angst. He was looking directly in my eyes and saying "Yahi bus pakadni hai?" Bhak Mada... I had already hurled. Hesitatingly appended "Haaaan!" "Peeche baith jaao. Let's see!" 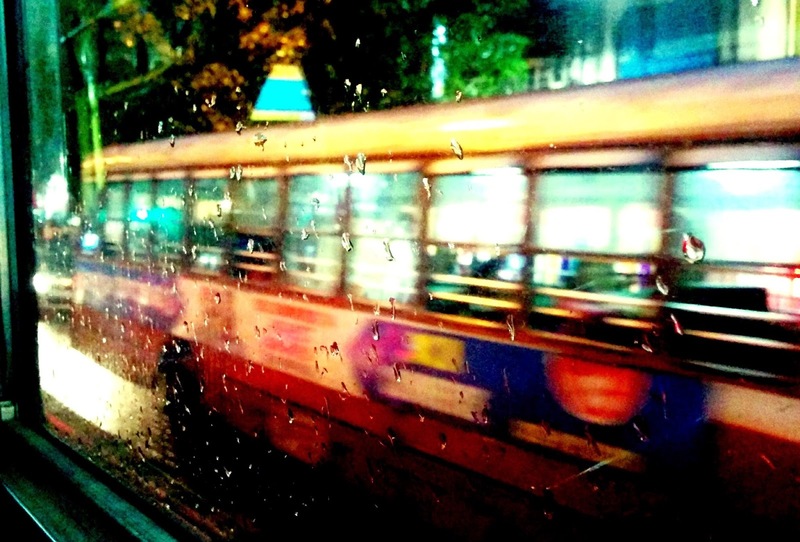 And this random stranger vroomed ahead as I sat on his scooty, chasing the speeding bus in the rains. We reached the next bus stop. I hastily got down and before I could reach the back door, the bus speeded again. I looked at the guy with a grin. He gestured to sit back, smiling back. 15 minutes later as I sat on the wet bus seat, I tried to remember whether I had found enough time to thank the guy in my rush to catch the bus on the next stop. My blue bordered umbrella was closed now. "Stop being cynical about everything", I heard myself saying. It happens sometime. We all have become busy machines. It happens sometimes in life. We all have become busy machines.